Smokey Quartz for New Moon in Gemini 6-4-16 – GemPowerment. Reveal your light. Smokey Quartz activates the Earthstar and Root chakras to ground and provide stability. Howdy to all my Sparkly GemPeeps out there in the Universe and Happy New Moon!! There is a serious party in the Solar System, with practically every planet having some active influence on the New Moon energies. There is just too much to outline in a detailed manner and lots of great info on the internet if you are needing more information, but I will outline some of the biggies. First of all, in addition to the Sun and Moon being conjunct in Gemini, Venus is also conjunct with them. Gemini’s main traits are communication, flexibility, learning, complexity, mental stimulation, and curiosity, but can also have a tendency to spin in the mental realms, and communication can have an edge to it. With Venus’ presence there is a focus on coming down to Earth and talking about relationships and matters of the heart with deep love. With the New Moon, speak from the heart to your loved ones about creating the relationships you desire and envision and what win-win strategies you can come up with to bridge the gap between where you are now and where you want to go. Use the Gemini energy to be willing to listen and learn something new. Balance your intuition with your mind in this endeavor, as Gemini is also about balancing two aspects of the same coin. This of course is also helpful in one’s relationship with self…be kind and be truthful to align with your true desires. With this mutable Grand Mutable Cross (also coined by Alice Bailey “The Cross of the Hidden Christ”) we are being invited to question everything. With Jupiter, Neptune, and Saturn, along with Venus (along with the Sun and Moon) we have access to expanding beyond our current limitations, using our imaginations to co-create resolutions to issues and dream a new dream, and the ability to identify and set healthy boundaries as we move forward. How can we embrace our divine (Christ-like) natures…our True Selves…and everything that means, while living in our daily lives? This is a great energy to discover the answer to this question. What needs to change so we can activate our Divine Human Blueprints for optimal wellness and joy? There is a lot to take in, consider, feel, and eventually, to do. The Universe is conspiring with you in this New Moon time with the assistance of all these other planets, etc. to make serious progress on this issue. So, how can the Crystal Realms help us in this time? 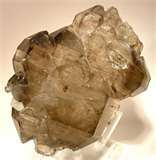 Smokey Quartz!! It’s interesting I don’t get this stone more often from Guidance, but it’s one of those I think crystal workers just have on the back burner of awareness all the time as a given. There is quite a lot going on energetically, so we could really use assistance in keeping things real….grounded and positive…with clear thinking and an uncluttered auric field. Smokey Quartz activates the Earthstar and Root chakras to ground and provide stability. This stone is great for keeping us happy in the physical body; even when we are going through challenges. Even though the New Moon energies will only last a few more days (3 days before and 3 after), we can process all this we set into motion with the help of Smokey Quartz until the Full Moon on June 20th.